*Tap* *Tap* *Tap* Is this thing on? Sorry for the radio silence around these parts. I’ve been in a bit of a funk lately and just haven’t felt like blogging. Probably I should do it anyway seeing as how I started this blog focusing on things that make me happy in order to try and break myself out of a similar funk I was in a few years ago. I’m going to try to be better about posting around here. 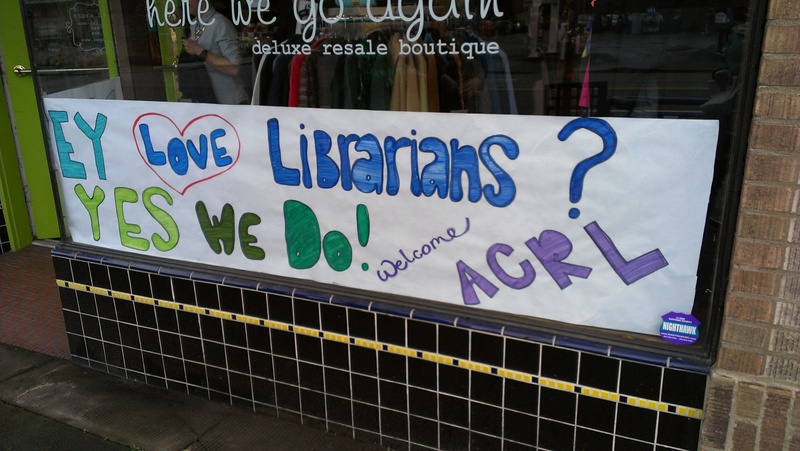 Another reason for the lack of posting is that I spent most of last week traveling to Portland, Oregon for the Association of College and Research Libraries conference. 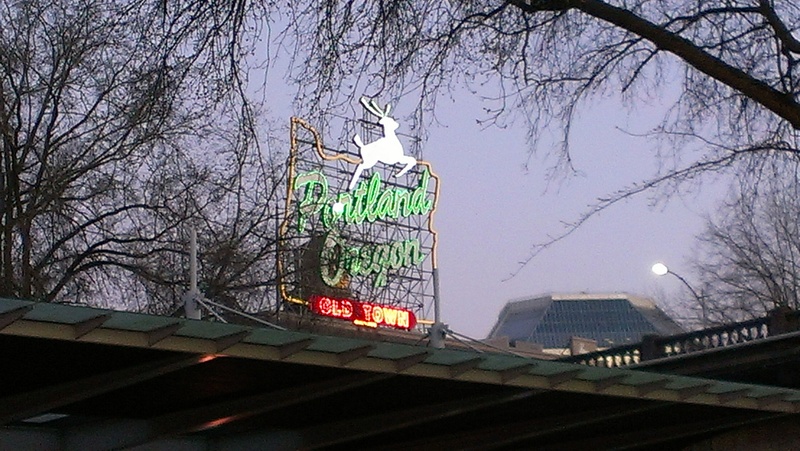 I had always heard amazing things about Portland, but had never had the chance to go before so when they announced it as the location for the 2015 conference I marked it off my calendar to attend. 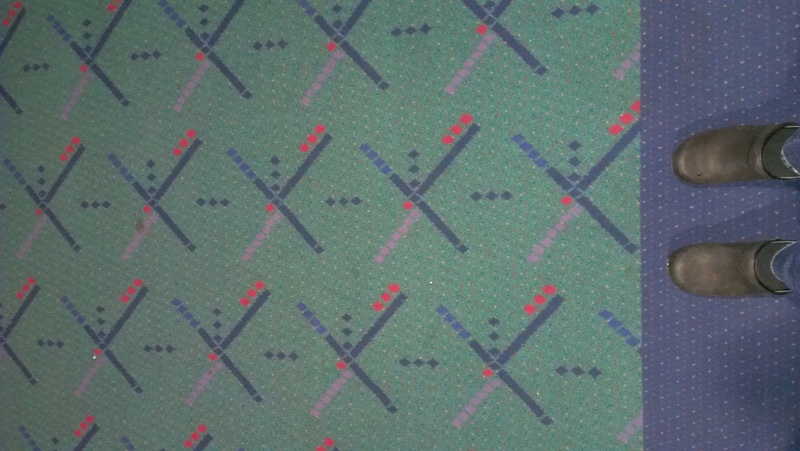 The famous PDX carpet. It’s apparently obligatory to take a picture at least until it’s finally all replaced. I know most people reading this don’t care about the actual conference, so I won’t say too much about that. As you may recall from an earlier post I was doing a poster presentation at the conference. I think it went well. A number of people were interested in the topic, and I even had someone try to recruit me to apply for a job they have open right now. It’s in Michigan though, and given my hatred of the cold I don’t think that would work out for me. There unfortunately weren’t a lot of presentations that were focused on the types of things I’m doing in my job these days, but I did attend a couple of really good round table discussions. I also thought the keynote speakers for this conference were excellent. Librarian conferences weirdly have a tendency to have keynote speakers that don’t really have anything to do with libraries or only in the most tangentially related ways. This conference was no exception, but they were all great speakers and I loved what they had to say even though I’m not sure how much of it was applicable to my actual job. G. Willow Wilson, the writer for the new Ms. Marvel series was the least relevant personally to me, but still a great speaker with a lot of great things to say. Most of Jad Abumrad of NPR’s RadioLab’s talk was entertaining, but obviously a mostly canned presentation he’s done before. Parts of it did resonate with some things I’m feeling about my life and job at the moment even though I’m not sure it helped make any of that more clear for me. The closing keynote speaker was Lawrence Lessig, who I was super excited to hear speak. I literally did a little dance in my office the day they announced him. His speech as expected was really inspiring and did help make me feel more inspired about some things I think about a lot but haven’t done much to actually try to drive into action. 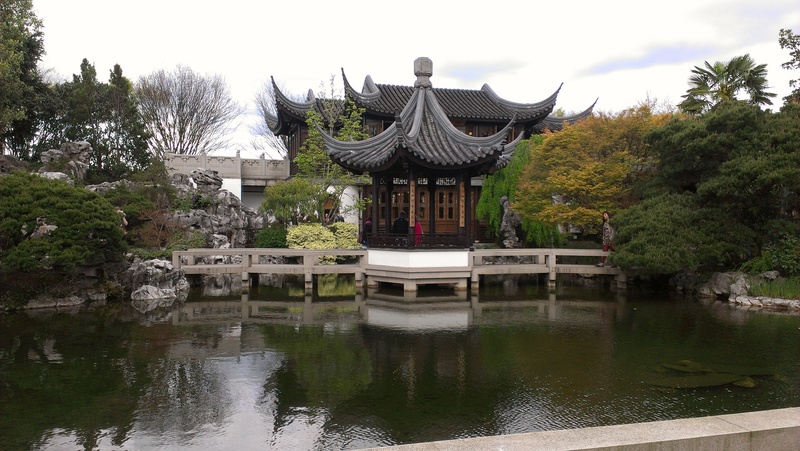 Aside from doing stuff at the actual conference I did get to play around Portland some. I got in Tuesday night. My friend Alison happened to join me on my plane in Chicago during our layover, so I got to take advantage of her work paid for cab to get to my hotel. After that we grabbed dinner at an excellent Japanese restaurant around the corner from where I was staying. I don’t remember the name of it, but it’s in the Roosevelt hotel. I said you can tell it’s good Japanese food when you walk in and 90% of the people eating in it are Japanese. The opening keynote wasn’t until Wednesday afternoon, so my friend Natalie, who I was rooming with, and I started off the morning with breakfast at Voodoo Donuts. 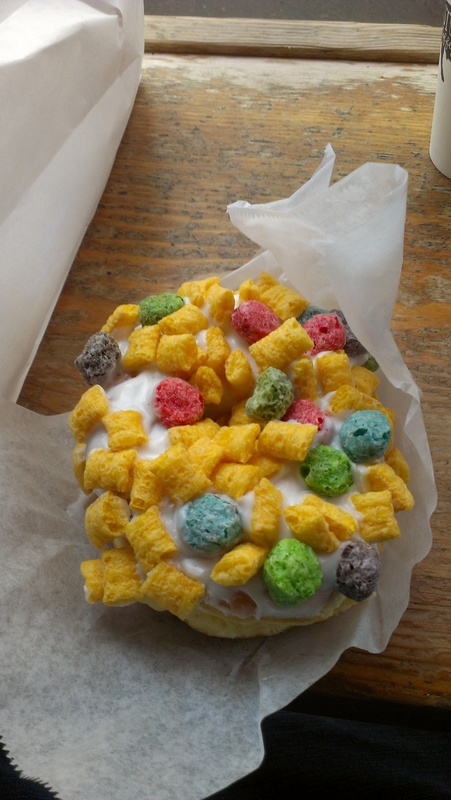 Captain, My Captain doughnut from Voodoo doughnuts. It was delicious, but I admit I felt a little ill after eating that much sugar. We then did the proper librarian thing and headed over to Powell’s City of Books. It was slightly overwhelming. After that we walked over the convention center to register, then walked to meet up with Alison. We then did a lot more walking. We stopped at a thrift store, that amusingly was catering to librarians at the conference with a special discount and gift thanks to the owner having a librarian friend who alerted her that the librarians were in town. 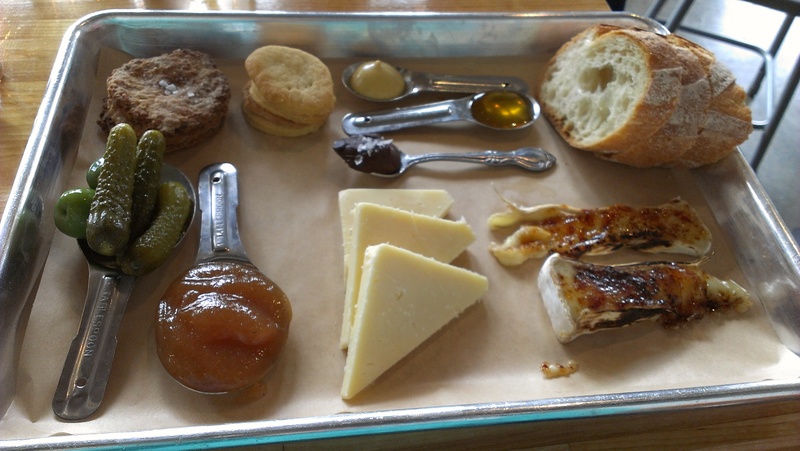 After that we grabbed lunch at a delicious place called Cheese & Crack that specialized in well lots of cheese plates. It was delicious. Natalie and I made the trek back to our hotel after that to get ready for the opening keynote. At that point we had walked about 10 miles. I reached 12 by the end of the day. As you can tell if you’re someone who likes to walk Portland is a very walkable city. I very much appreciate that about it. I walked to the convention center from my hotel every morning. 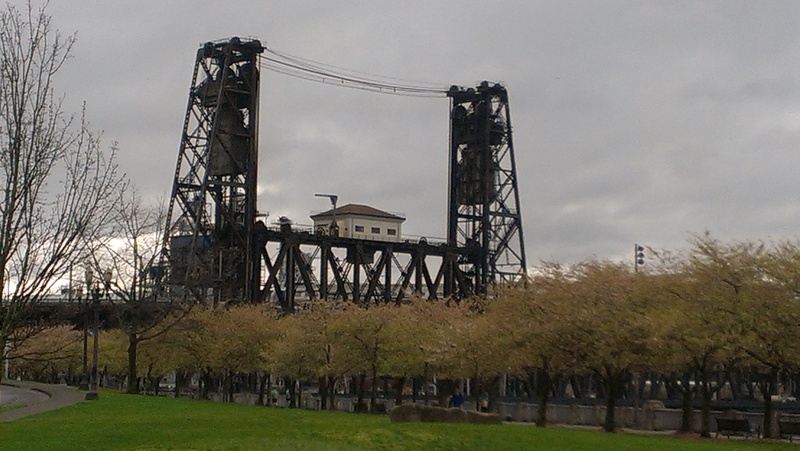 The Steel Bridge, which I walked across on my way to the convention center every morning. I have a lot of librarian friends in Maryland who were at the conference, but when I’m at conferencesI like to try and hang out with people from other places that I don’t get to see all the time. I didn’t have any plans with anyone for dinner on Wednesday night, but used Twitter to find someone to dine with me. The power of social media at work. We had a nice dinner at a place called Bottle + Kitchen. Although there are always a plethora of receptions and other after hours parties, meetups, and activities that go on at library conferences I’m usually pretty lame. The 3 hour time change didn’t help anything. I was pretty much ready for bed by 8 every night given that equalled my normal bed time at home. I generally just went back to my room after dinner, and am completely fine with that. As an introvert conferencing takes a lot out of me, and I generally am not up for much more after dinner even when I’m not contending with jet lag. Thursday afternoon I decided to bail on the vendor lunch I had signed up for because the location was really inconvenient. I was just wandering off to find some lunch on my own when I stumbled into a gaggle of my Maryland library friends headed off to some thai place whose name I cannot remember in the least. I guess they have two food truck locations, plus the brick and mortar place. It was pretty tasty. Thursday night I got to meet up with my Twitter pal Holly. We’ve determined that she is my west coast doppelganger. She’s not an academic librarian so wasn’t at the conference, but lives in the Portland area so came over for the day to hang out with us conference people. I got to snag her for dinner and we enjoyed a delicious dinner at Southpark Seafood. It was great to finally get to meet her in person. Sadly I’ll be out of town when she’s over my way in a few months. Friday night I made plans to meet up with another Twitter pal, who I often get together with at conferences or when I’m vacationing in San Diego where she lives. We just wound up grabbing dinner at Swank, which was the restaurant in my hotel. It was pretty darn tasty though. Friday night was also the all conference reception at the Oregon Museum of Science and Industry. After dinner we headed over to that. It was fun to wander around the museum and play with all the things, though I’m not smart enough to figure out any of the brain teasers they had scattered around the museum. Saturday afternoon after the keynote I met up with Alison and our friend Julie, a friend who used to live in Baltimore and work with me but who abandoned me and moved to Seattle. It was great to spend time with her. We had access to her car, so we got to go a little bit farther afield than I had made it at that point. We grabbed lunch at brew pub and then continued tasting Portland doughnuts at a place called Pip’s. They are mini doughnuts that come in denominations of 4. They were delicious and very different from the crazy overload of Voodoo Doughnuts. Everyone says Blue Star is great too, but their schedule never seemed to jive with when I would have been able to make it to one so they sadly went untasted. 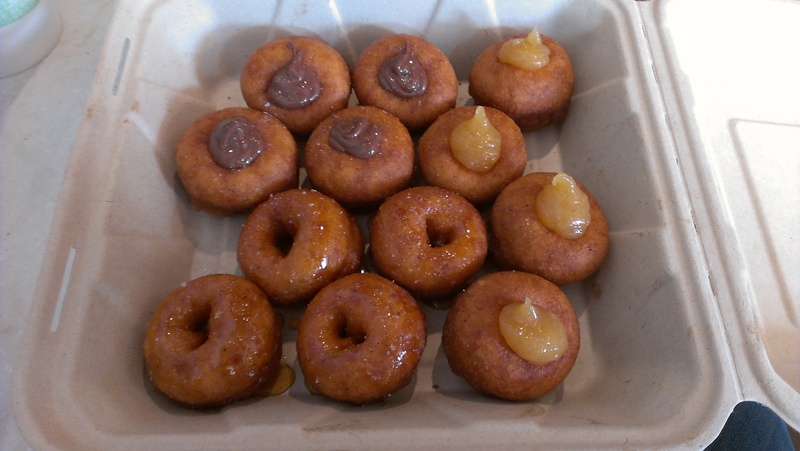 Pip’s Doughnuts. Raw honey and sea salt, Nutella and sea salt, and Meyer lemon pear butter. 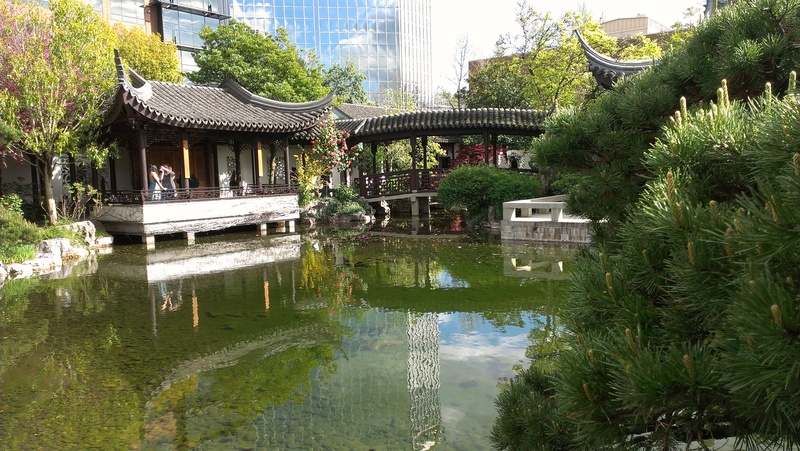 After that we headed to the Chinese gardens, which is a lovely little oasis in the middle of downtown Portland in Chinatown. The gardens were beautiful, and if you couldn’t see skyscrapers sticking up over the walls of the garden you would have no idea you were in the middle of a city. After that we headed to Powell’s books because they hadn’t made it there yet. It was a lot more crowded on a Saturday afternoon than it was when I was there on Wednesday morning. I totally cracked up though when I overheard to employees talking to each other. One of them was saying to the other that they needed to keep better track of librarian conferences because tons of librarians kept coming and immediately looking for copies of the Ms. Marvel comic, which they had apparently been sold out of since Friday morning. We finished out the day by wandering around the stores in a neighborhood called Nob Hill and grabbing some dinner at a sushi restaurant. All in all it was an excellent trip. I’m really glad I finally made it to Portland, and I can definitely see why so many people love it there. I’m not sure how well I would deal with the gloominess they deal with for much of the year, but everything else about it that I could see makes it seem like an excellent place to live. The next ACRL conference which happens in 2017 is going to be in Baltimore, so I look forward to showing off my beloved city to some great librarians. 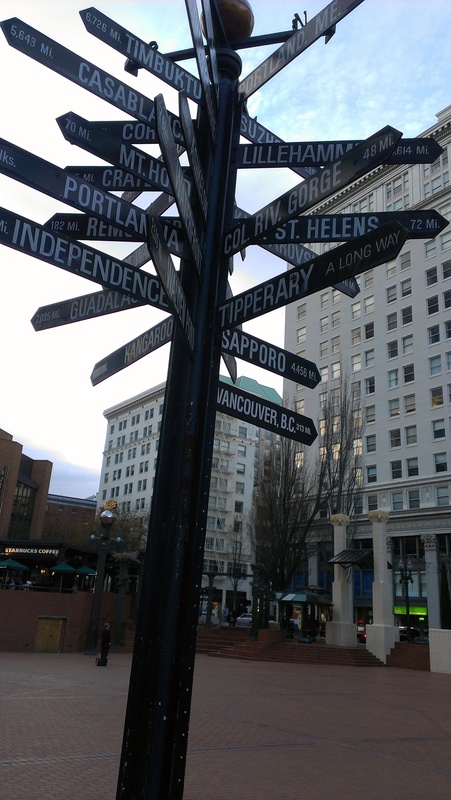 This sign in Pioneer Square cracked me up because of the Tipperary arrow. I’m not sure anyone else was amused by it as I was.